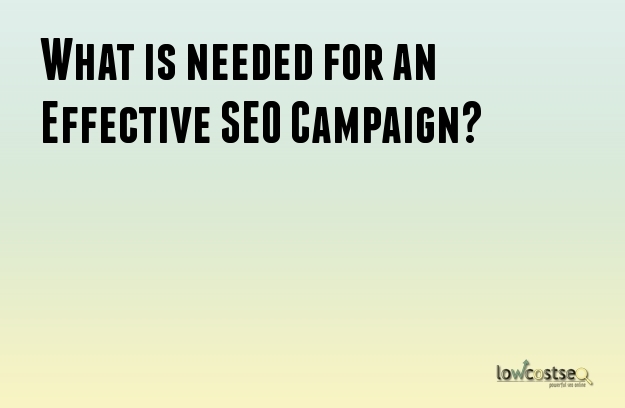 What is needed for an Effective SEO Campaign? Once upon a time we barely knew anything about SEO and now, many of us are already close to discovering the best approach and strategies in the world of digital advertising. In this article, we will focus on what kind of information we should gather. Whether you are a small business owner or a blogger, the goal is to create a path for search engine users to follow through and lead to you. To do that, we have to know what their urgent questions are and how we can provide an answer that can 1) let them subscribe to your weekly contents, 2) purchase or view your services and 3) Build your brand quality. Keep on providing solutions until they consider your page as a reliable source. That way, you are gaining more exposure through social media sharing, plus it enhances your chances of earning more organic search results. If you’re still in the first phase of getting to know your potential customers, you can start with using surveys or a bunch of educated guesses that will slowly build your hard data that will consist of keyword research results, buyer test results, and web analytics. DO: Provide unique and accurate content in different forms (Videos, photos, or articles) – DON’T: Produce random and unrelated links on your site. This can lead to more problems with Google eventually. The search engine industry is worth billions (approx. $65 billion!) Not just Google (although it is leading) but together with Yahoo!, Bing, Baidu, Ask.com, AOL and more. Its contributing factor is its users who start their internet experience through searches. Tools are everywhere, some of them are free while others will cost you. Getting familiar with whatever’s free and optimizing it to your advantage can save you a lot of stress and expenses. Trust me, I know what it’s like to spend a lot of money on something that doesn’t work. That does not mean that we don’t have to take risks though. We just need to identify which methods are considered “risks” so that we don’t simply go into battle without a weapon and preparation. Learn more about your onsite elements and work on how it can be utilized before proceeding to offsite elements. For example, if you know that there are unconfigured 404 pages on your site, fix it first before proceeding to social media marketing. On-Site Elements: Page titles, meta descriptions, image alt texts, H1 tags, properly formatted URLs, mobile accessibility, internal links to name a few. Off-Site Elements: Social media marketing, email marketing, link building – your outside efforts to pull more people into visiting your website. DO: Take advantage of free tools online like Google Search Console, Moz Local Listing Score, Bing Webmaster’s Tool, Schema, etc. – DON’T: Skip on any element or focus only on one – they will all contribute to your Search Engine Optimization efforts. Page titles and meta descriptions will make or break a content, in a user’s point-of-view. Even though a title should only have one sentence and the meta description should have 155 characters, they are still in-charge of letting people know what your content has to offer. Low-quality and short contents aren’t making it much to the top spot anymore. This is because search engines are looking for pages that provide more details while linking to reliable sources, to avoid a cluttered SERP. Penalties are also given to sites that are using black-hat SEO methods and spammy content. And even if you know that you are using clean strategies but fail to occasionally check your site’s analytics – you will always be in the dark. Don’t panic when your site’s traffic starts to decrease due to an update though, there will always be a way to fix it. DO: Keep tabs on your site’s analytics and progress. If you are working with an SEO firm, they should deliver weekly/monthly reports. – DON’T: ignore major search engine updates, they’ll get to you anyway. Googlebot has a limit when it comes to crawling websites every day. As a site owner, you probably have noticed that it could take weeks before Google acknowledges the changes on your site for better ranking. Unless your page is frequently crawled, that could give you an advantage. If not, your website’s home page and high-level category pages are more likely to be crawled first compared to an aging content. Wouldn’t it be nice if it does offer miracles? Like waking up in the morning knowing that your site has reached more than a million users? On the web, the reality is still applied. No work is successful without failure, effort and stressful moments. Even the best Search Engine Optimizers out there still make mistakes. But they move on past that and build a new strategy. That’s what SEO is, trial and error. So, how long does SEO take? There is no such time frame. It will depend on your 1) competition: What are your methods or products that are better than the other? 2) content: Are you able to produce new, interesting and genuine blogs, tutorial photos and videos? 3) Inbound links: Are the best websites linking you or are the low-quality ones harming your brand name? DO: know that it may take more than six months before you SEE results. – DON’T: Fall into the pit of failure if it took you a year to see results. Again, your factors may have delayed the progress. Organic search results still hold the throne. More than 70% of search engine users browse past an ad to click on the top organic result. Inexpensive SEO methods are still valuable, but it does not mean that paid ads are a waste of money. Combining SEO with SEM can speed up the process if done right.